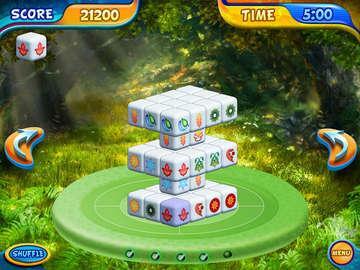 Explore a universe of relaxation with Mahjongg Dimensions Deluxe, a wonderful 3D twist on the classic game of tiles. Experience the majesty of this ancient game like never before as you travel through six blissful dimensions, each with their own power-ups and arrangements. 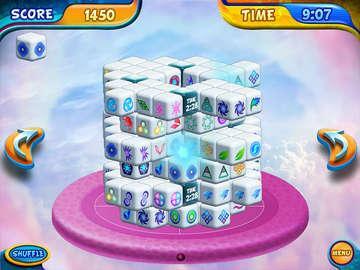 The unique game play allows you to rotate the patterns for a better perspective, while using speed and combo chains to score bonus points. Featuring gorgeous graphics, three different modes, a sweeping orchestral soundtrack, and hours upon hours of addicting tile-matching fun, this is the most immersive, yet soothing Mahjong experience you'll ever set your eyes on. 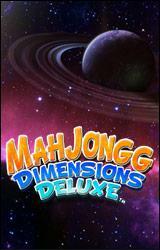 Play Mahjongg Dimensions Deluxe free with the demo version or download the full version today! As the name suggests it is a great game of Mahjong but with a twist in the tale. You would be matching tiles as is common with Mahjong but on a 3-D playing field. Thus you would have to rotate the three dimensional puzzle structure formed by these tiles in order to make the right match. The game is a fantastic combination of traditional Mahjong style tile matching but with a 3-D puzzle and an under one minute game play. You need to score as much as possible in less than a minute. That would be your main goal all along the game. You would be using the keyboard to spin the puzzle around and then will have to click on identical tiles to make matches. But like a time management game, you would be racing against time all through the game. The need for speed is felt in this game like never before. The faster you make matches, the better it is for you. The sense of competition as imbibed in the game play makes Mahjongg Dimensions even more enjoyable. You can compete with opponents and strive to be the top of the leaderboard. Options such as sharing and sending gifts to friends are also integrated in the main game play. Moreover there are time bonuses and multipliers to reward players when they play well. 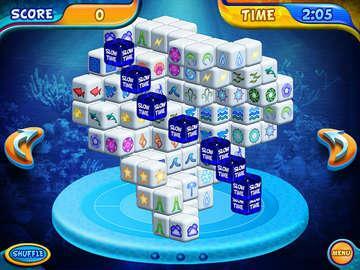 It is an addictive game overall and a befitting addition to the Mahjongg league of games. It is sure to be wildly popular with fans of this genre and this Chinese game of tile matching would just always attract more and more people to it. You would love to play this tile matching game where tons and tons of tiles with unique images are piled atop one another. The flexibility to rotate the playing field adds an element of realism to the game and makes it more engaging. You would always be anxious to know what is on the other side of the puzzle!! A visually appealing game with a really novel way of tile matching make Mahjongg Dimensions a lovable game.